The epitome of form meeting function, these headphones are in a league of their own. Designed and built in California, these innovative in-ear headphones are unlike any others. From their unparalleled sound to their unique design aesthetic, Audeze built the iSINE 10 headphones without regard for the status quo of dynamic driver designs. 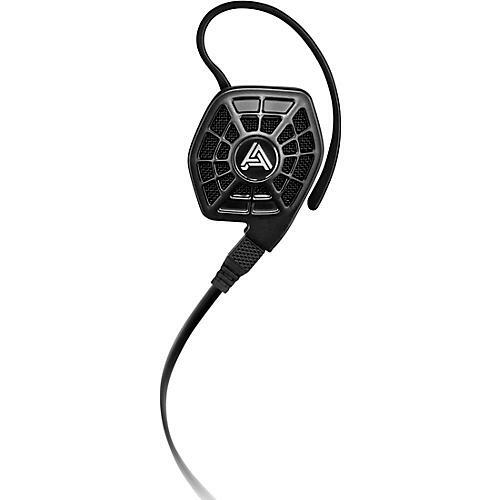 Thanks to its proprietary Fluxor magnets, Audeze was able to design more efficient drivers in a much smaller package. The iSINE 10 headphones deliver precise control and fast response times without distortion so music always sounds alive. There’s simply no other in-ear headphone that even comes close to their performance. Weighing a scant 20 g., the iSINE 10 delivers powerful, high-quality audio that surpasses that of larger traditional headphones. The power-enhancing Fluxor magnets nearly double the magnetic driving force on the large, ultra-thin 30 mm diaphragms to deliver an astoundingly accurate listening experience. Customize the sound in real time with the Audeze iOS app, which features two presets and a 10-band equalizer. Refine the bass levels and tamp down the highs on peaky recordings. The two EQ presets travel with the cable when switching devices. Audeze’s award-winning Cipher Lightning cable is specifically optimized for the iSINE Series, and delivers 24-bit digital audio from Apple devices to the headphones. The Cipher cable contains a high-quality inline amplifier, digital-to-analog converter, and DSP for a vivid, life-like audio immersion. Order yours today for a listening experience unlike any other.